You can take Skinny Fiber or Skinny Body Max for the rest of your life and it can help you to maintain your weight (along with other things); just as we take omega-3, vitamin c, etc. On the other hand, you can take Skinny Body Max or Skinny Fiber to help with weight loss, and then stop taking it once you have accomplished your goals. The choice is yours ... the difference is whether you make the necessary healthy lifestyle changes. So to recap: 1) You can make no changes and use the products for the rest of your life or 2) take Skinny Fiber or Skinny Body Max to lose weight while developing habits that contribute to long term health ... I suggest that you read the following to learn the best changes to make that help with long term natural weight loss! The following are the best 4 changes that help with weight loss and developing a healthy lifestyle. The opposite of these four are the 4 major reasons why people gain and cannot lose weight in addition to some that are missing like STRESS, DISEASE / SICKNESS, HEREDITY, OVEREATING (including too much healthy foods too). It is recommended that we drink 1/2 our body weight in water. For the average who are a few pounds overweight then at least 64 ounces of water will do --- you can increase the water intake with tea, watermelon juice, infused waters, etc. if you do not drink enough water in respect to your body's needs, you will feel hungry no matter what. Dehydration makes us feel hungry and eat more. * With Skinny Fiber at least 64 ounces a day is suggested. Go for water instead of food in between meals :) Give up the pop and sugar drinks. Exercise can range from aggressive house cleaning and gardening, to cycling, weight lifting or running. You have to determine what is best for you and without any extra stress to you. If you have been sedentary and would like to gradually start exercising, walking is always a wonderful start. You can walk inside or outside of the home; with or without any machines. Here is a video that I recommend: Leslie Sansone Walk At Home for getting started in a walking routine. Fitness centers and gyms have become much more affordable over the years. I recommend that you join a gym to help you start exercising regularly; they all give initial consultations that help you get started in what you need to do to shape up. * What if you can't exercise at all because of health or physical limitations? 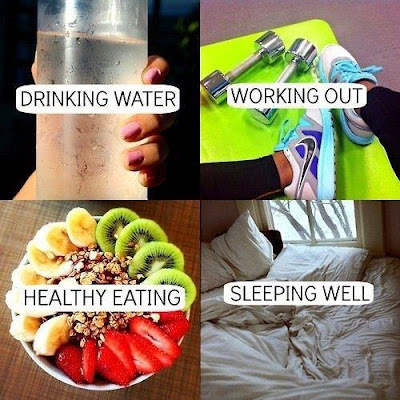 Then it is super important that you drink the proper amount of water, eat "clean", get 7 to 8 hours of good sleep time, reduce the stress factors in your life and take your Skinny Fiber or Skinny Body Max as recommended each day. Eating healthy means something different to certain groups of people. Some think that eliminating pop, bad carbs / sugars, red meat, etc. is all this means, and this does hold true for the masses. Yet, there are some that believe that eliminating all meats and / or all dairy products contributes is really a healthy diet and clean eating; with the third group being those who chose organic / natural foods to assure that the quality of their food is that for optimal nutrition. It is best to consult with a doctor / nutritionist to determine which is the best overall diet for you. * The goal is to learn to eat healthier for your body and to make these changes permanent, therefore if you are tempted to do Atkins, Juicing, Paleo, Low Fat, Low Carb or whatever, you have to have extreme commitment to the choice, so that you have the intended weight loss and health benefits, and continue with this way of eating for the rest of your life (hence the phrase "lifestyle change"). Getting the proper amount of sleep is extremely important for optimal health. You can actually gain weight / hinder your weight loss efforts by not getting enough sleep because your metabolism does not function correctly. If you are used to sleeping just 4 hours a night and change that to 7 hours a night, you could actually lose weight from the sleep increase. There is a lot that goes into weight loss, nutrition and health, but these are the 4 basics that we should first consider when trying to lose weight / maintain weight and become our healthiest. If you are not hydrating the way your body needs, not eating healthy, not exercising and not sleeping the proper amount of time for your metabolism, then you are on a path that can lead to (if it has not already) to obesity, sickness / disease, depression and so on. So, why not make these 4 changes that can help with weight loss, health and happiness? REMEMBER that no one is perfect and slip ups will happen while the healthy / good habits are developing, therefore it is to your benefit to start making gradual changes, develop a good support system and never give up (especially on these basics that could make a world of difference to your health and for your weight loss goals). Just do not give up!!! Join our Healthy Lifestyle / Natural Weight Loss Group to learn more about health changes you can make, as well as organic / natural food changes, and for recipes, motivation and support. Here's to YOUR healthy lifestyle and weight loss success!